Your forward-thinking municipal leaders are continually making sure FireSmart is a feature in the design and planning for our communities, long-term. Policies are thoughtful about resident protection and safety. And, notably, our region’s leaders invested in FireSmart education to reinforce for residents the importance of getting informed, taking FireSmart action at home and, in this way, becoming a member of the FireSmart team. Recent wildfire news from Greece is heart wrenching, with over 80 people killed, 100 km/hr winds affecting the spread of wildfire through residential areas and a lack of preparation in those areas prior to the wildfire. Loss of life is the worst-case scenario, no matter the circumstances. The situation serves as a reminder to be aware of the wildfire threat where you live and the ways to make your home and community ‘FireSmart’. In our region, there are people who have created non-combustible zones around their buildings and made FireSmart-informed decisions for their entire property. Others sought FireSmart resources, such as a Home Assessment, as their first step. 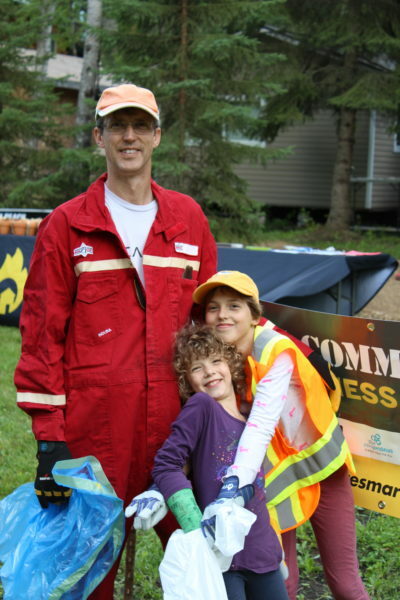 And FireSmart Community Leaders, like Gwen Zwick, Dan Tarney and Connie Schultz, have very successfully organized and hosted Cleanup events in their neighbourhoods. What was the start to these achievements? People learned more about FireSmart. You can be proud about the FireSmart education in our region. It’s proactive and multi-layered and it’s happening because of strong partnerships and a team of phenomenal people. FireSmart Canada has designed and built the foundation of FireSmart and continually works to connect groups within the province and across the country. We learn from each other about best practices and innovative ways to be FireSmart and we bring those ideas home to our regions. Working together with Alberta Forestry is integral to the education success in our region too. Our programs fit together well because much of what we do is all about living with and managing for wildfire on our landscape. Firefighters are the uniformed champions of FireSmart and we are fortunate to have Forestry, municipal and volunteer firefighters in our region. Firefighters learn about FireSmart practices and educate as a built-in feature of their roles in the community, in their work and at home. Our key educating partners are the Lesser Slave Lake Bird Observatory and the Lesser Slave Forest Education Society. These groups are primarily responsible for developing our school-based FireSmart curriculum and bringing this programming to schools in the region (and beyond). They feature FireSmart activities tailored for local day camps such as EnviroQuest and Future Firefighters. You’ll see these Educators at Fire Hall Open Houses and public events, like the recent Riverboat Daze Block Party in Slave Lake. It’s easy to learn about FireSmart and to make it a part of your family’s practices. Getting informed and taking action on your property helps you as an individual, but it also helps protect your community. Each person doing their FireSmart part serves to protect the home, in the event of a wildfire, and to slow or stop the spread of wildfire through a community. Take action, do your part, and join the FireSmart team today! To learn more, ‘Like’ us on Facebook, click in with Instagram and Twitter, check our website at www.livefiresmart.ca or contact us at 780-516-0077.